Segmenting search queries into different Google Shopping campaigns can be very easy – if you don’t have too many keywords you need segmented. However, if you want to work with 10,000 or more product-related terms, you’ll find that AdWords has some limits that make things a bit more complicated. People searching for part numbers know exactly what they’re looking for. It absolutely makes sense to separate these terms from the rest to be able to bid higher on them. Part numbers also have the huge advantage that they’re readily available in the MPN field of your product data. A campaign can only have 10,000 negative keywords. A negative keywords list can hold up to 5,000 keywords. There can be 20 lists per account. An ad group can have up to 20,000 targeting items. Negatives, product groups and other items count towards this limit. An account can have 5 million targeting items at the ad group level. You can’t get around those limits, but there are a few ways to make it work. The following is how we do it. 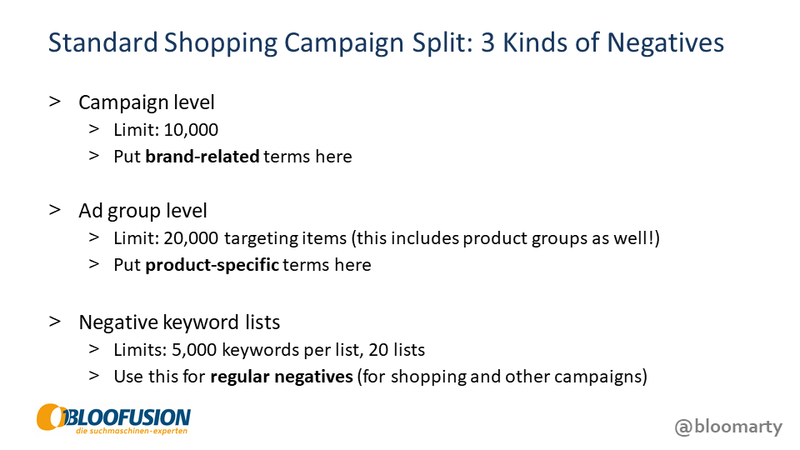 For the standard segmentation, there are three kinds of negative keywords: brand-related terms, product-specific terms and regular negatives that we generally don’t want to bid on. Keeping those terms separated makes things easier to manage. First off, using lists exclusively for regular negatives that have nothing to do with the query segmentation prevents the day-to-day account management from interfering with the campaign split. This way, no one can accidentally move an unwanted term down the funnel. Those keywords counting towards a separate limit is also an advantage. Having brand-related terms on the campaign level gives you the flexibility to organize your brands inside the campaign however you want. The limit of 10,000 negatives is usually not a problem with brands. Putting product-specific terms like part numbers at the ad group level allows you to create ad groups for groups of products and just supply the negatives for the respective products. Keep in mind that the 20,000 targeting items limit includes negatives, product groups, audiences and other items. Filling up the group with negatives will limit your flexibility with other targeting methods. For the 3 million parts I’d recommend using several ad groups. The easiest way to do this would be to use a custom attribute as a group number and then target products from one group number per ad group, excluding the associated part numbers with negatives. For large numbers of products, negative keywords can get out of hand. The 3 million products here are a great example: You could have 3 million negatives, but most of those would probably be useless since only a fraction of your products will be searched this way. Our approach is this: Instead of using potential negatives right away, we collect them in our database. Then we compare these terms to the actual search queries to see which ones would actually make a difference. Only those pre-qualified terms are used as negative keywords for segmentation. This approach lets us save on unnecessary negative keywords and allows us to work within the limits much longer. The downside is of course that the first time someone uses a product-specific term, it won’t end up in the appropriate campaign right away. If you’re advertising a lot of products that get searched only once per year, this approach is probably not for you. 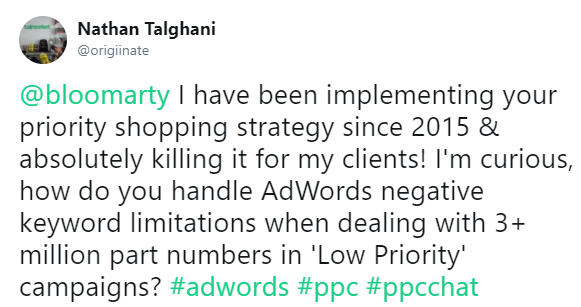 Sending large numbers of product-specific queries to separate campaigns can be tricky since Google never intended Shopping campaigns to be built this way. 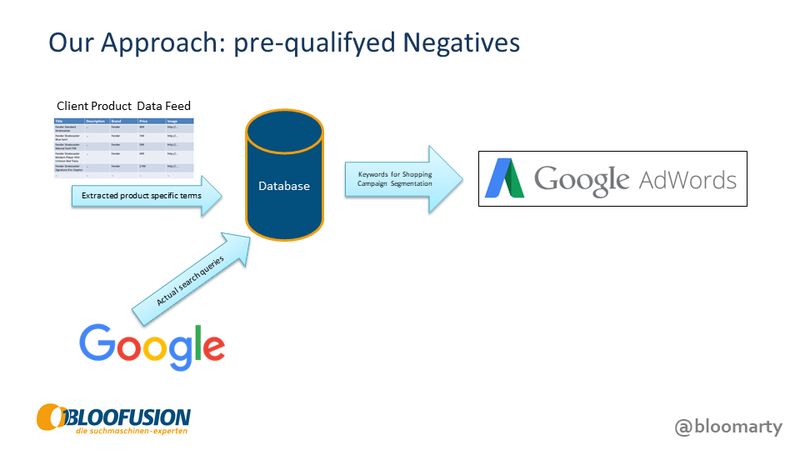 Pre-qualifying negatives can help reduce the number of keywords substantially, which somewhat mitigates the problem. Beyond that, there’s always the option to split things up, even across accounts, if necessary.